There are three Nanaimo dive shops currently active. Two of the shops, Sundown Diving and Sink or Swim scuba have been and are PADI representatives, which is the largest and oldest scuba training agency worldwide. While the third shop, NDO recently changed to PADI after years with SDI/TDI. "PADI stands for "Professional Association of Diving Instructors" by the way, and if you are going diving anywhere, it is always best to choose a business that boasts the PADI logo, that way you are assured professional and safe diving services. I consider Sundown Diving (PADI dive shop), owned and operated by Ed Singer, Nanaimo's "go to store" for Scuba Diving Services. Sundown offers qualified instruction for beginners and right on up to advanced as well as technical training. This shop is fully stocked with equipment to either buy or rent, as well as being certified for repairs and maintenance to all makes and models of dive equipment. Ed is a commercial diver himself and offers all manner of commercial diving services. He also has other commercial divers on staff to meet any of your underwater repair or salvage needs. While the third shop, Nanaimo Dive Outfitters has recently switched to being a PADi shop, apparently they still tout the SDI / TDI banner as well, which was developed by "Technical Diving International" to train sport diving to the public. All of these shops offer similar goods and services but differ in some respects, particularly in respect to quality of service. My personal preference is to use Sundown Diving. Ed and his knowledgeable and helpful staff, will take care of you, whatever your diving needs. You can get either air or nitrox fills, rentals and repairs, new and used equipment, dive charters, guides, training, you name it! Pretty much anything one needs to dive in the chilly but beautiful waters surrounding Nanaimo and Vancouver Island can be found at any of the three shops in town. Check out their web sites or face book pages as well! with groups of divers heading for local Nanaimo dive sites. The shops also schedule mini vacations to some of the more special locations here on Vancouver Island. has some of the best diving on the planet, or Hornby Island sort of north/central island has Flora Islet where the six gill sharks occasionally make an appearance, or even Barclay Sound on the west coast is another of Vancouver Islands best dive destinations. 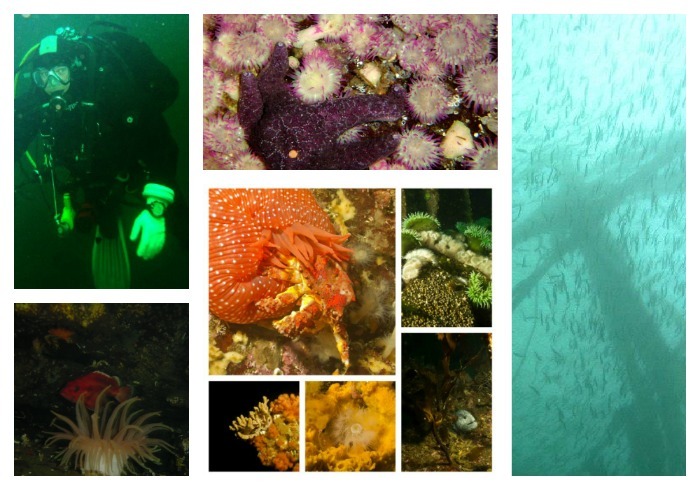 If you are a diver but have not donned a dry suit to visit the temperate waters surrounding Vancouver Island, you may be missing out. The diving here is spectacular, and seriously, a dry suit keeps you warm. Not all dive shops have "certified" repairers assembling and maintaining dive equipment. So ask that all important question! We dive with a ''life support system'' and hey, its your life!